I am so excited to post about Katy and Alex now that I have some groovy professional pics to do so! Talia and I first "met" with them via a phone call with Katy, her fiance Alex and her adorable parents Kathy and Doug during the late winter of 2007. College sweethearts (hint, he was her TA), Katy and Alex lived in California, and although Katy's parents were in Texas, they both had East Coast roots and therefore wanted to have a Connecticut wedding. Logistically speaking, planning a wedding across the country could have seem overwhelming and complicated, but we executed it ever so smoothly with two extended weekend visits to CT in which we selected all of their vendors and planned their day from soup to nuts. All photographs are courtesy of Studio 1923. Jerome, you did such a beautiful job; you truly captured every last second of this lovely wedding we worked so hard on over the past year. On Saturday, July 19, Katy and her ladies started their day with an intimate luncheon thrown together by a family friend and then they all gathered at her suite at the Stamford Marriott Hotel and Spa to prep by the talented Dana Bartone and staff. It was at this time my assistant Alicia and I checked in with them. The crew had a great time the night before at the rehearsal dinner and were in high getting ready spirits. Outside was hot and steamy, but inside the bridal party was as cool as cucs. A seasoned scrapper, Katy took a paper class in California and beatifully designed her entire stationary suite with a unifying paisley paper. 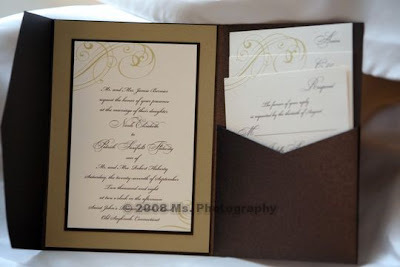 Some fun details of the invite, program and welcome bag taken in the suite. Katy wore her long hair curled and lightly pulled back. Her make-up was soft and natural. I love, love this photo. She wore an amazing lace dress by Pronovious. Her veil was made from a piece of her mother's wedding gown by a local seamstress in California and was the sweetest compliment to her ensemble. Once all the beautifying was done, the bridal party headed over to the Country Club of Darien for Katy's first moment with Alex. After touring eight venues and four ceremony sites up and down CT, we ultimately came back to the timeless elegance of the Country Club of Darien; every inch of what the quintessential club should be. The ballroom has an incredible tray ceiling and the veranda, sigh, there just was no comparison. Jerome and I set up the first moment on the golf course. I love the expression on their faces! Bridal party formals followed. The maids wore Siri Granada in smokey blue and the guys wore their own suits. The gals carried arrangements of bright pink gerbers and roses, by Pat Heller Designs of Oxford. Pat totally nailed our gerber/happy/country feel vision and was so nice and agreeable to work with. Katy's bouquet had little bits of blue delphinium as her something blue, imagine that! They were married at 5:30 in the evening by their former Bucknell Chaplain, who as luck would have it, recently transferred to Yale to be a Chaplain there as well. He gave an incredibly touching ceremony that was so meaningful to the couple. O'Brien Strings provided the music and a friend sang a capella. Both were the perfect accompanyment. I had to post this photo as this wedding was my first experience with the real wedding bands actually being carried by a ring attendant. The pillow itself was handmade, with a little wooden shoot in the center for the rings. I love the expression on the attendant's face as she does her best to be super careful! She was absolutely adorable. The ceremony site was decorated with striking arrangements in hydrangea, gerbers and roses with curly willow adding to the height. The aisles were lined with shepherds hooks holding white baskets with a similar composition. Following ceremony, Darien did a gorgeous spread for cocktail hour under the veranda and a Synergy keyboardist played light jazz tunes for the summer's evening soiree. 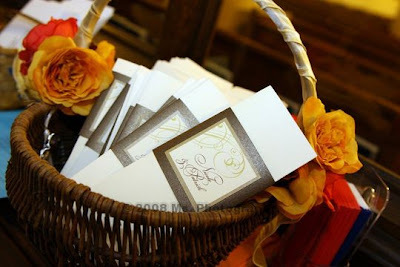 Outside, guests were greeted by place cards and the photo guest book Jerome made with their engagement shoot. The guestbook, in particular, earned snaps from both the guests and staff alike. Inside, the ballroom was so graceful we decided to let it shine in and of itself. 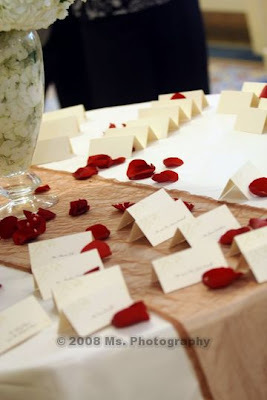 The round tables were decorated with candlebras from Party Rental and tiny square arrangements featuring mini gerbers and spray roses; placed on top of monogrammed runners made by Katy. Menus were tucked discreetly into folded napkins that were laid on top of Darien's glorious china. Julias provided the exquisite chocolate on chocolate cake cake, with an intricate pattern to mimick the lace in Katy's dress as well as their signature monogram. One of things we always do is request the bride and groom's beverage of choice. Alex's has been the most honorable yet, as his was a glass of milk, too cute for words! The reception was a combination of plated courses, open toasting and dance sets. Synergy played numerous sets of old fasioned rock and roll that got the college and family crowd up dancing the whole night long. This shot is prime evidence of the great party! 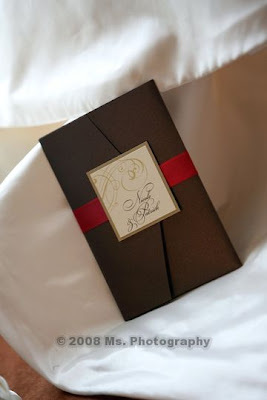 At the end of the night, guests were bid a sweet farewell with a chocolate favor. Katy, Alex, Doug and Kathy . . . it has been both an honor and a privelage to work with you. I had an absolute blast planning the wedding over the past year and a half and getting to know your family. Katy and Alex, the two of you had happiness written all over your faces every single time we saw you. You are the perfect compliment in every way. I wish you the best of the best. Taking bow, thank you, thank you!! Talia and I are thrilled to announce that Sixpence For Your Shoe has been chosen to be featured in Style Me Pretty's Little Black Book of Vendors for Hartford, Connecticut. We were first rung up by Abby and Michelle back in June and are just ecstatic to *finally* have our name listed with those in the industry whom we admire most. Being considered a "Best Wedding Vendor" is such an honor for us, as we are head over heels in love with our business and everything weddings. Style Me Pretty (could the name be any cuter??) is hands down, the best wedding blog out there. It is chock filled chic ideas and inspiration, swoonworthy featured weddings of all kinds and budgets and fabulous projects to try at home. We continuously draw up on this site for daily injections of creativity and also pass it on to our girls (and guys!) as well. It is seriously pretty is as pretty does. Thanks so much ladies, we can't thank you enough! As many of you are familiar, October is Breast Cancer Awareness Month. There isn't a person I know who doesn't have a connection to at least one woman who has been affected, who has struggled, who has perservered, who have survived, and some who have sadly lost their fight to this terrible form of Cancer. Whether you are a bride thinking of a charitable donation in lieu of traditional wedding favors or just and individual interested in donating to a worthy cause, I encourage you to consider one of the many wondeful organizations who work so hard to find a cure, spread education on preventation and early detection, and help women and their families at their greatest time of medical need. Some such organizations include The American Cancer Society, Susan G. Komen for the Cure, or The Pink Ribbon Store where purchases in part support the National Breast Cancer Foundation. Well this is my first official post. My name is Rachel and I am Talia and Lindsay's assistant wedding coordinator. I recently got engaged on July 4, 2008 and my fiance, Gary, and I are now in the wedding planning stage. I have posted one of my favorite pictures from the night Gary proposed. Even though I am a newcomer to the blogging scene, I thought it would be fun to share my thoughts with you as I go about my journey as a bride to be. Tonight, I just got back from working with Talia at Eolia Mansion at Harkness State Memorial Park and my mind is running. I can't even think about sleeping now so this is why I am posting at 2:00am. On my drive home from the wedding tonight, I was trying to envision my wedding day. I was thinking about all the things I wanted to do. My adrenalin was high. How could it not be? I had just finished working at what I believe is one of the most beautiful venues in Connecticut. Then I began to think about how each wedding has its own special feel...how do I want my wedding to feel? I guess I am still piecing that together. I will keep you posted as the details unfold. We first met with Karen and Andrew in July of 2006. Newly engaged and over their heels in love, they knew they wanted to be married overlooking the water on Sunday, September 14, 2008, be surrounded by sweet details, dance the evening away with a killer band and say good night with a sparkler send-off. With these elements in mind, we toured the tri-state by car and on-line in search of the perfect location, finally choosing The Candlewood Inn in Brookfield, which is serene and elegant inside and out. In the two years that followed, we booked the remaining of their vendors and designed their entire coordinating stationary suite. By the end of this journey we all felt like old friends and their wedding was absolutely lovely from start to finish. All photos with the exception of certain specificially disclosed were taken by Sixpence For Your Shoe. On the big day, Karen and her ladies began prepping the Courtyard by Marriott in Danbury by Dana Bartone for hair and Naomi Martinez for make-up. Jane of Just For You brought in the bouquets and they were just as we had imagined. Then, Jerome of Studio 1923 came in and picked up my camera and shot these. Why can't I do that? Karen wore a Ramona Keveza gown and matching veil, purchased at Kleinfeld. Girls wore J. Crew Sophia in black (always a nice choice), pearl necklaces (a gift from Karen) and their own shoes. Later on that night as she was being bustled in front of the mirror in the bridal suite and Andrew watched he said, "Karen, that's the perfect dress." It was. Andrew and his fellow gents looked quite dapper in tuxes from Antonio's, who from my experience does the bets fit there is. Andrew was distinguished from the pack by an ivory vest and pocket square. They were married at 4:30 in the afternoon by Rabbi Howard Herman. One dream Karen always held on to was to see Andrew for the first time at the ceremony, as opposed to before when signing the ketubah, as is tradition in the Jewish faith. Rabbi Herman understood this and granted them this wish and allowed them to sign the ketubah as part of their ceremony. It flowed perfectly. Jane did a rustic chuppah softened by blooms that incorporated the veil Karen's mother wore on her wedding day. It blew ever so slightly in the gentle breeeze. Here is a close up of it. A few shots of the ceremony. The ceremony site was lined with shepherds hooks and lanterns. The weather and windstream was in our favor, as all candles stayed lit. Millennium Music accompanied the ceremony and played beautifully, as always. Meanwhile, Talia and I were busying prepping the inside for the reception. Here is a very Newport-esque shot of the sun-streamed sunporch at Candlewood; one of the reasons Karen fell in love with the venue. After the ceremony, the couple spent some private time together on the docks, known as Yichud in the Jewish tradition. And then they were treated to champagne by their car from Antique Limo. It was important to Karen to have an antique car and I'm so glad it worked out! Inside cocktail hour was well under way with jazz trio by Synergy. Some fun food shots we took. Cheese never looked SO good. The tables were dressed with all white linens. Menus and table numbers were designed by us, the napkins folded meticulously by Talia, with the menus tucked ever so neetly within. We decided to utilize some of the hurricanes provided by the venue and opted to alternate floral rings around the hurricanes on some tables with urn arrangements on others. It was a great contrast. The room looked fresh, yet soft. Here is a close-up of the arrangement on the sweetheart table. 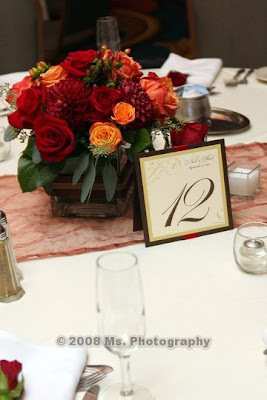 The roses, orchids and hydrangea made such an eye-pleasing centerpiece. The cake was made by the bakery at The Waterview, who always does a fabulous job. Orchids and tiny yellow roses were the *perfect* garnish. Dave Pettigrew and the band from Synergy played a great mix of old and new. The night concluded with the much anticipated sparkler send-off to the Theme From Cheers , as it held a special place in the couple's hearts. What a great party! Karen and Andrew, we hope you had an amazing time throughout Europe. It's been a wonderful journey planning together over the past two years. I hope the wedding you had equates the dreams you spoke of at our first meeting at the Simsbury Starbucks. The two of you just radiate with love for one another and we wish you a lifetime of dreams coming true.